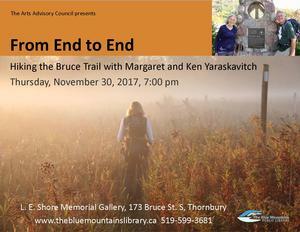 Join us Thursday, November 30th at 7:00 p.m. in the Gallery to hear about Margaret and Ken Yaraskavitch's Bruce Trail trek from end to end. 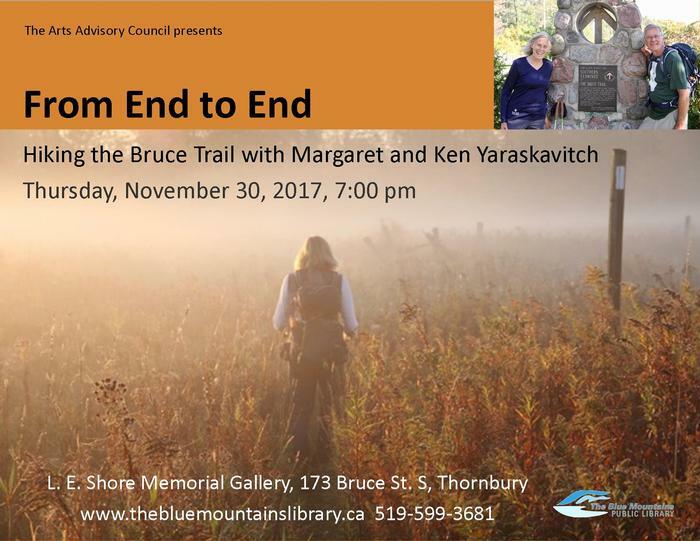 In the Fall of 2017, Margaret and Ken Yaraskavitch hiked the full length of the Bruce Trail from Tobermory to Queenston Heights, Niagara. Margaret will share some of their experiences, from people met on the pathway, appreciating flora and fauna, logistical juggling, lessons learned and other challenges, and the joy of walking.